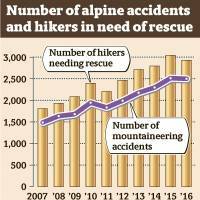 Reflecting the recent rise in alpine accidents amid Japan’s trekking boom, experts say hikers should get insurance covering search and rescue expenses, which can be extremely expensive. 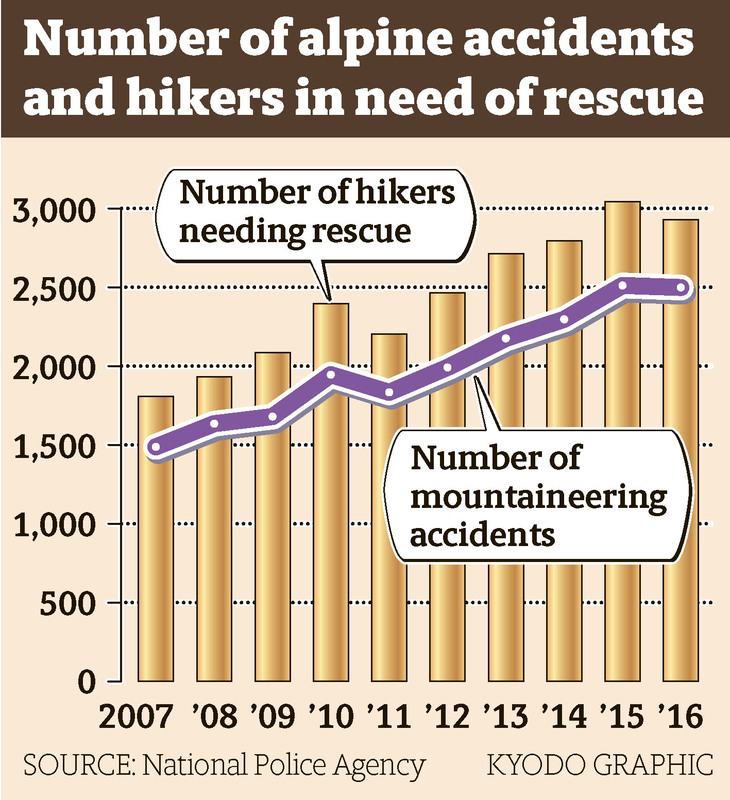 There were 2,495 mountaineering accidents across Japan in 2016, the second-highest figure since officials began compiling comparable statistics in 1961, according to the National Police Agency. A total of 319 people died or were never found, while 1,133 were injured. If police or other public organizations are mobilized to deal with a mountaineering accident, taxpayers get the bill for search and rescue operations. But if private rescue teams are called in, the victim must pay the additional costs, which run very high. “Deploying a helicopter can cost up to ¥10,000 per minute and daily payments per rescuer could come to tens of thousands of yen,” a person familiar with private rescue services said. The association provides a reasonable insurance service that covers rescue costs incurred during trekking and other outdoor activities. The underwriter is Mitsui Sumitomo Insurance Co. If the insurance policy is bought on a group basis, the insured need to pay an annual subscription fee of ¥1,000. The premium is about half the sum needed for an individual contract. In the case of full-fledged mountaineering, premiums charged for a one-year contract would be ¥6,900, which covers up to ¥1 million for rescue costs and up to ¥100 million in indemnity liability. A mountaineering insurance scheme offered by Mount-bell Co., an Osaka-based outdoor clothing and equipment maker, can be purchased on the internet and is valid from the afternoon of the next day. The insurance, underwritten by Fuji Fire and Marine Insurance Co., covers a maximum ¥5 million in search and rescue expenses and up to ¥100 million in indemnity. The annual premium for a basic plan is ¥8,450. A mutual insurance program operated by Japan Rescue Organization LLC in Tokyo, meanwhile, covers rescue costs incurred by its members if they are involved in a mountaineering accident. The members are required to pay an initial fee of ¥2,160, plus an annual fee of the same amount. Up to ¥3.3 million will be disbursed for search and rescue costs, using part of the funds put up by the members against accidents.